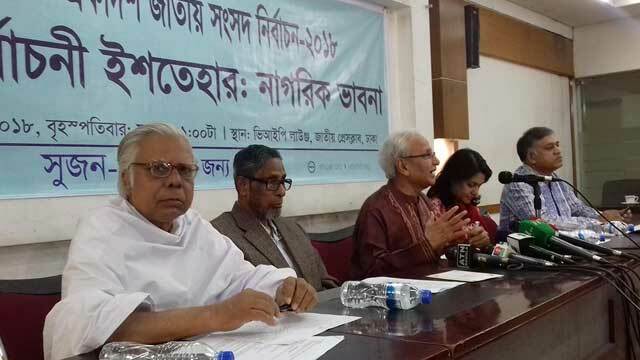 Dhaka, Dec 6 (Just News): Syed Abul Maqsud, a columnist and civic rights activist, today said the Election Commission is under an “invisible pressure” and therefore, it is failing to perform properly. The noted journalist said this while speaking at a programme organised by Sushashoner Jonno Nagorik (Sujon) titled “Nirbachoni Ishtehar: Nagorik Bhabna [Election Manifestos: Citizens’ Thoughts]” at the Jatiya Press Club in Dhaka this morning. The EC should follow its responsibilities as per the constitution in order to perform its duties properly to hold a free, fair and credible election, he said. Maqsud also slammed the ruling quarter saying their leaders and activists are acting like public relations officials of the EC as they tend to praise and support every decision taken by the commission. Badiul Alam Majumdar, secretary of Sujon, said the political parties in their election manifestos should come up with their workplans for the first 100 days, 1 year, 3 years and 5 years if they are elected to power. The issues of good governance and public expectations must be reflected in the manifestos, he added.